Phillip Blumel: I am on the edge of my seat, biting my fingernails. We’ve had some big victories this week, and more key votes are imminent. Phillip Blumel: Hi, I’m Phillip Blumel. 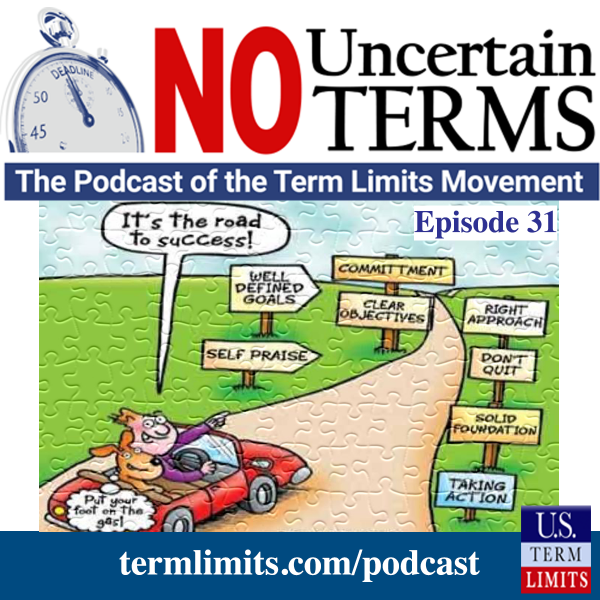 Welcome to No Uncertain Terms, the official podcast of the term limits movement for the week of March 11th, 2019. Phillip Blumel: What’s got me in this state? Well, for the details, let’s talk with U. S. Term Limits Director, Nick Tomboulides. Nick Tomboulides: Hello, Phil. Happy term limits week. Phillip Blumel: Term limits week, oh, it sure was. Where do we even start? Nick Tomboulides: Well, like I say, it has been an amazing week, very action-packed week for the term limits movement, Phil. We have seen the legislatures of three big, important states take action. The State of Arizona, where the Arizona House of Representatives passed the term limits convention. Nick Tomboulides: Just yesterday in Georgia, the Georgia State Senate passed the term limits convention, so both of those states are now half-way there. And by the time this broadcast airs, the State of West Virginia, likely will have taken action on the term limits convention, as well. Nick Tomboulides: So we’re seeing amazing progress. You need 34 states to get a term limits convention started, and we might get three states in a week. That’s nearly, you could round that up almost to about, that’s about nine percent progress we’re accomplishing in possibly one week. So the movement has just made amazing strides, this week alone. Phillip Blumel: Boy, it sure has. Well, let’s take, let’s look at each of those states individually. The first vote was Arizona, right, and it was the Arizona House that passed the Term Limits Convention Bill. Phillip Blumel: How’d it go? Nick Tomboulides: Well, it was fairly close, but we had a nice, some breathing room. Nick Tomboulides: Passed on Monday by a vote of 32 to 26, and it was a bipartisan vote. It was carried forward by our sponsor, Representative Kelly Townsend, who’s been just absolutely amazing on this. But we also have to give, she’s a Republican, but we also have to give a lot of credit to the Democrats out there. We could not have done it without the Democrats. Nick Tomboulides: Representative Robert Maze, Representative Daniel Hernandez, we’ve given these guys champion of term limits awards before. They were under intense pressure from special interests, lobbyists to cave in and vote against this, but they both stood tall, and they both stood strong. So we’re very pleased about that. Nick Tomboulides: If you know anything about Daniel Hernandez, he’s not just a term limits hero, he’s a real world hero. He was actually the guy who stood up to the shooter in Tucson in 2011, saved the life of Congresswoman Giffords. So he’s a remarkable guy, amazing background. It’s just been an honor for our team to work with him on this, and we really appreciate his support. So Arizona is going very well. It’s now in the State Senate’s hands. Nick Tomboulides: Our team on the ground, Suzette Meyers and Bob Berry, have been talking to senators for a year, to try to figure out where they stand on this. And right now, we have a win by a one-vote margin if the vote were held today. But let’s say, one of the senators gets a flat tire on his way to the capitol, it may not pass. So we need to shore up our numbers. Nick Tomboulides: Folks who are listening to this podcast, if you live in Arizona, if you know anyone who lives there, tell them to pick up the phone and ask their state senator to pass this. It is HCR-2022, 2-0-2-2, for term limits on congress. Because we need to win Arizona, we have to get this convention going, and it’s the only way we’re going to get rid of these self-serving politicians in Washington. Phillip Blumel: Is there an action page set up for people to send messages to Arizona Senators? Nick Tomboulides: There is. If you go to termlimits.com, there’s a big button on the right hand side called Current Actions, and the first item on that dropdown menu is contacting the Arizona Senate. Scott Tillman: Hello, this is Scott Tillman, the National Field Director with U. S. Term Limits. I have an update on our legislation in Washington. This week, we have two new co-sponsors joining us. Indiana Senator Todd Young joined 11 other senators, as a co-sponsor on SJR-1. Scott Tillman: The primary sponsor on SJR-1 is Ted Cruz. Bradly Burr, Congressman from Alabama’s First Congressional District co-sponsored Francis Rooney’s HJR-20. HJR-20 now has 36 sponsors and co-sponsors in the U. S. House. There will be a special election in the 12th Congressional District of Pennsylvania. Scott Tillman: This past Saturday, March 2nd, Republicans nominated Fred Keller as their candidate for the position. Fred has pledged to support the U. S. Term Limits Amendment of three House and two Senate terms. Fred will face Democrat Marc Friedenberg in the May 21st special election. Friedenberg has not yet signed the U. S. Term Limits Pledge. Scott Tillman: On April 30th, voters in North Carolina’s Third Congressional District will choose a new congress member in a special election, six candidates in this race have signed the U. S. Term Limits Pledge. Scott Tillman: U. S. Term Limits will have a booth at several upcoming Young Americans for Liberty events: April 12th through 14th in Philadelphia, Pennsylvania; June 28th through 30th in Memphis, Tennessee; and July 19th through 21st in San Jose, California. Then later this year on September 6 through 8 in Austin, Texas, and September 27th through 29th in Detroit, Michigan. Scott Tillman: Please find the Young Americans for Liberty website, and look us up, and meet us at these events. Phillip Blumel: All right, next on the list was Georgia. We had a successful vote. The Georgia Senate passed the Term Limits Convention Bill. Nick Tomboulides: Hell, yes. Georgia is in the opposite position of Arizona. In Georgia, it was the State Senate that passed the term limits convention. They just did it yesterday with a 31 to 20 vote. It was a little different, this was a party line vote, with the exception of one Republican who defected and voted against us. Some guy named William Bylgone. I don’t know what his deal is, maybe his constituents will punish him for that. I hope they do. Nick Tomboulides: But Senator Bill Cowsert is the man in Georgia. Cowsert is the guy that really took this thing from getting introduced on the State Senate floor, just over a week ago, and got it passed through the State Senate in a week, which it’s a pretty remarkable feat that almost never happens. Cowsert is a genuine guy, he’s a true term limits believer. We wouldn’t be anywhere in Georgia without his help. So now it’s the opposite of Arizona. Nick Tomboulides: The challenge is the State House in Georgia. We think we have the votes, but the Speaker, David Ralston, has been a tough nut to crack, so we also need to generate calls and emails into the Speaker of Georgia. Phillip Blumel: In either Arizona or Georgia, are there any more committee hearings to go through, or is it going to the floor? Nick Tomboulides: I believe, in Arizona, it is going to the floor. In Georgia, it’s in the Rules Committee. But a lot of these states’ power resides with the leadership. So it’s really the leadership that decides which bills are going to get heard. And in Georgia, the man who makes that call is Speaker David Ralston. So that is the guy we need to contact. Nick Tomboulides: I actually have his phone number for his legislative office for folks to give him a call, tell him to bring congressional term limits to the floor, bring SR-237 to a vote. His number is 404-656-5020. 404-656-5020 to contact the Speaker in Georgia. Don’t call him if you don’t live in Georgia, but if you do live in Georgia, make sure you do. Phillip Blumel: Okay, and is there a webpage set up for that, as well? Nick Tomboulides: Same thing we’ve got set up for Arizona, termlimits.com. Current actions, Georgia is up there, as well. Phillip Blumel: All right. Great. Next on the list is West Virginia. Now this one is going to be a cliffhanger for our podcast listeners because the vote could happen over the weekend, could happen Monday morning. It’s imminent. Nick Tomboulides: Yeah, we’re going back to the future on West Virginia, because by the time this airs, it may have already voted. The resolution is at the finish line there. We’ve got two U. S. Term Limits personnel, Shanna Chamblee and Aaron Dukette out there, they are rock stars. They have literally moved to West Virginia, and are basically camping out in the snow, on the lawn of the State Capitol until term limits pass. So it’s incredible dedication. Nick Tomboulides: The bill, it’s got through the subcommittee and the committee on the House side. It should be the final item on the House calendar Saturday, the ninth. And then it should move directly to the State Senate. So we should know this weekend what the fate of term limits is in West Virginia. Phillip Blumel: Wow, what a week. Phillip Blumel: Guam and Representative Hank Johnson. Guam is a territory of the United States in Micronesia in the Western Pacific Ocean. As an American territory, it has a Democratic form of government, which may soon become more Democratic. Phillip Blumel: Senator Telo Taitague recently introduced Bill 5435, which would limit senators to six consecutive years, or three-two year terms in office. The Guam Daily Post agrees, this is a good idea. In a March 3rd unsigned editorial titled, Guam Senators Need Term Limits, the editors declare, “It’s time. Guam is likely to benefits from term limits on lawmakers, as other jurisdictions have. Our community needs a mechanism so that elected leaders are more responsive and responsible.” Indeed, they do. Phillip Blumel: We’re not familiar enough with Guam’s politics to know exactly what inspired this embrace of term limits on the island. But here on the mainland, we have many inspirations, such as Congressman Hank Johnson of suburban Atlanta, who regularly runs unopposed, or in wildly-lopsided elections to hold his House seat. Turns out that, perhaps, Hank Johnson has something to do with Guam’s embrace of term limits, as well. Phillip Blumel: In this clip from 2010, Representative Johnson was speaking with Robert Willard, Commander of the U. S. Pacific Command, about the potential dangers caused by stationing additional troops in Guam. Hank Johnson: This is a island that, at its brightest level is what, 12 miles from shore to shore, and at its smallest level or smallest location, it’s seven miles between one shore and the other. Is that correct? Robert Willard: I don’t have the exact dimensions, but to your point, sir, I think Guam is a small island. Hank Johnson: Very small island, and about 24 miles, if I recall, long. So 24 miles long, about seven miles wide, at the least widest place on the island, and about 12 miles wide on the widest part of the island. And I don’t know how many square miles that is. Do you happen to know? Robert Willard: I don’t have that figure with me, sir. I can certainly supply it to you if you’d like. Hank Johnson: Yeah, my fear is that the whole island will become so overly-populated, that it will tip over and capsize. Robert Willard: We don’t anticipate that. The Guam population, I think, currently about 175,000, and again, with 8,000 Marines and their families, it’s an addition of about 25,000 more into the population. Hank Johnson: The whole island will become so overly-populated that it will tip over and capsize. Robert Willard: We don’t anticipate that. Phillip Blumel: To our friends in Guam, Godspeed. Perhaps you have already seen the phenomena of the undebatable incumbent who has lost his marbles, or maybe you just watched Hank Johnson videos on YouTube, and want to protect yourself. Oh, yes. There’s more Hank Johnson YouTubes, go check them out. Phillip Blumel: Trevor Noah is the Host of Comedy Central’s Daily Show. Noah shared his view of term limits on Steven Colbert’s program in February. Trevor Noah: I’ll be honest with you. I’ve gotten to a point, where I feel like in America, you need to limit all politicians to a single term. I’ll be honest, I know this sounds crazy. But I think, America has gotten to a place where all your politicians are more focused on getting reelected than actually just doing what they were elected to do. Stacey Selleck: If you think members of Congress are serving longer and longer terms, your suspicions have been proved correct, as evidenced by the latest report entitled, Congressional Careers, William T. Egar, of the Congressional Research Service. Stacey Selleck: “Long gone are the days of citizen legislators, where turnover was frequent, and resignations commonplace.” Politician is officially a professional career, as the average tenure of representatives has had a nearly four-fold increase since the turn of the 20th century, and the average tenure of senators has more than doubled. Currently, the longest serving Representative is Don Young, with approximately 46 years of service in the House, the longest serving Senator is Patrick Leahy, with 44 years of service in the Senate. Stacey Selleck: Since the inception of Congress, there has been a marked increase in the proportion of members seeking reelection, and noticeable decreases in the proportion of incumbent members defeated. Meaning, more incumbents run, and more incumbents win. Since 1890, the number of incumbents not seeking reelection hover steadily around 10%. Reverse that, 90% of incumbents seek reelection, another figure that doesn’t seem to drop below 25% is the proportion of congressional incumbents that win reelection since the 1950s, reelection rates hover above 95%, and sometimes close to almost a 100. Stacey Selleck: Translation: Incumbents rarely lose. Roughly 24% of the current Congress has 12 years or more experience in at least one chamber, and the trend is on the rise. The factor is attributed to increased tenure or expansion of incentives associated with the perks, power, and prestige of holding Congressional office. And it is also attributed to institutional changes, such as increased incumbent advantage, gerrymandering, and political party influence that decrease an incumbent’s chances of defeat at the ballot box to less than five percent. Stacey Selleck: The days of citizen legislator in Congress are gone, for now. Read the full 2019 Congressional Research Services Report, as authored by William T. Egar at termlimits.com/blog. Nick Tomboulides: This issue, a couple years ago, this issue was just out of sight, out of mind for most of these guys. It has been the volunteers of this organization, the folks who read our newsletter, the folks who go to our website, go on Facebook, listen to this podcast. Phillip Blumel: The people that are listening right now. Nick Tomboulides: You, the listeners, you have been the grassroots engine that has powered this vehicle, and gotten us this close to the finish line. So my only word of advice is, let’s finish the race, and let’s win. Phillip Blumel: Right. Switching gears a little bit here because our major project, the number one goal of U. S. Term Limits is to pass a Congressional Term Limits Amendment to the U. S. Constitution, and that takes 34 states. Call in for the Term Limits Convention, either to force Congress to act on its own, or to hold a convention, and have the states do it, right. Phillip Blumel: But that doesn’t mean that we are only for term limits for the U. S. Congress, and as reported last week on this podcast, we’ve been making strides in Florida on the issue of school board term limits. And that’s made some progress over the last couple weeks, and we’re going to have our next hearing on Tuesday next, and this will be our first hearing in the Senate. Phillip Blumel: So to recap, in the House, we’ve been through two committees successfully. We have one more committee before we hit the floor, we believe. And on the Senate, we’re having our first committee hearing on Tuesday, and there will be a lot of term limits supporters in those chambers, testifying to legislators on behalf of this bill. Nick Tomboulides: Yeah, it’s great. A lot of people were asking at the very beginning of this project, “Well, why does school boards need term limits? I mean, it’s nothing like Congress, right.” Well, no. It is. Incumbents at the school board level are almost as invincible at the ballot box as congressional incumbents. They get reelected about 90% of the time. About half of the time, school board incumbents don’t even have a challenger. Nick Tomboulides: These people who say, “Why don’t you just vote people out? That’s term limits.” That’s a non-starter here because there’s no competition. So school boards are one of the offices in this country that are the most tightly controlled by incumbents. There’s a lot more money flowing into these races at the local level than there used to be, and so it’s really important that we put a check on that, and get some regular rotation, get some new blood into these seats, so that people can serve their communities. Phillip Blumel: Thanks for joining us again this week. If you live in Arizona or Georgia, be sure to email your legislators, telling them to support the Term Limits Convention Bill. Phillip Blumel: Go to termlimits.com, and across the top of the screen, you’ll find the Current Actions menu. Floridians can go to the same spot to urge their state reps to support the Eight-Year School Board Term Limits Bill. Phillip Blumel: Things are happening fast, you don’t want to miss a single podcast. The best way to do that is to subscribe. You can use the podcast app on your iPhone, go to iTunes, Google Play, or Stitcher. Just search for No Uncertain Terms. Phillip Blumel: If you can’t wait until next week’s podcast to find out what happened in West Virginia, go to termlimits.com, and we’ll have the latest news there. Shmank Shmonson: Hello, this is Congressman Hank Johnson. I have been in Congress for 12 years. It has recently come to my attention that the good people of Guam are trying to pass term limits. Here’s my concern with that proposal. If Guam passes term limits, millions of term limit supporters may descend on the island. It is an issue with 82% support, after all. Shmank Shmonson: If that happens, if millions of term limit supports come to the island, there is a real concern, a very real concern that the island may, in fact, capsize. And we don’t want that to happen, so please, keep your term limit support to a minium, to avoid such an unfortunate calamity. Thank you.